When a Celebrity Claims to Not Need Feminism. – The Small Things. When a Celebrity Claims to Not Need Feminism. 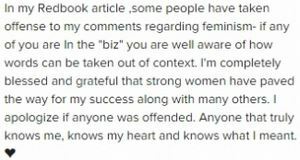 Just over a week ago a friend (we’ll call him Mike for privacy reasons) was scrolling through facebook and he came across a “feminist rant” about the Kaley Cuoco-Sweeting Redbook interview . Essentially, when asked if she identified as a feminist she said “Is it bad if I say no?”. The “rant” which Mike was reading aggressively called Cuoco-Sweeting stupid, it shamed her for her naive and privileged existence and it claimed that her opinions and thoughts were wrong. He looked up from his iPad with a confused facial expression and said “Isn’t it anti-feminist to call another woman stupid and tell her that her beliefs are wrong? If feminism is about equality, shouldn’t every woman have the equal right to her own opinions?” Now that is an interesting question, sir. On the one hand, I feel that it is incorrect to put down another woman’s beliefs and ideas and I definitely feel that calling someone stupid and wrong will cause more problems than it will solve. But I can’t go so far as to call it anti-feminist. Aggressive, definitely. Disrespectful, for sure. But anti-feminist, not quite. Mike puts forth a good point, the right to ones own opinion should be an equal right afforded to all men and women alike. I agree with that statement completely. Cuoco-Sweeting has every right to claim that she’s not a feminist. But I also have every right to have an opinion about her opinion. I think whats important here is the approach you take when voicing your opinion. The author of the rant used a very aggressive, harsh approach and it obviously rubbed Mike the wrong way. This is an issue because a lot of people are still warming to the idea of feminism and aggressive, radical writing is only pushing people in the opposite direction. It’s like the saying about catching flies with honey instead of vinegar. Aggressive writing is vinegar! At the end of the day I don’t disagree with that the “rant” said about Cuoco-Sweeting. Her statements clearly demonstrates her lack of knowledge surrounding the feminist movement and the rights of women across the globe. In the Redbook article she says “things are different now […] I’ve never faced inequality”. The reality is things are different in some places and in some they are not, things are different for some women and for some they are not. The “rant” author was correct in calling her naive and privileged, there is no denying that but calling her stupid was out of line. Cuoco-Sweeting is under educated on the inequalities facing women on a global scale and she is under exposed to the realities of inequalities facing women even in North America. She is a white celebrity, who makes a million dollars an episode! Of course she has never experience inequality! Here is the thing, if I am being honest, I have also never experience real inequality. Many women haven’t but that doesn’t mean that it isn’t happening at all, that doesn’t mean we should stop advocating for equal rights for all people, women and men. Cuoco-Sweeting has since apologized for the things she said in the interview, claiming that her words were taken out of context. Unfortunately, I think this is something fabricated by a PR rep. Out of context or not she said no when asked if she was a feminist, and that is all the context I need. I hope that this incident will open Cuoco-Sweeting’s eyes to the many aspects of feminism that she has been blind to. And I hope that in the future she will identify as a feminist, publicly and privately. Because I feel that at the end of the day every woman should be a feminist, every man should be a feminist, every person who identifies somewhere in between should be a feminist. To me, feminism means equality for all and everyone should support that.